"My dream would be to export the camel milk to the United States. I hear it's like gold over there." Halima Sheikh Ali is the proud owner of one of the few ATMs in Waji town in northeast Kenya. But rather than doling out shilling notes, it dispenses something tastier: a fresh pint of camel milk. 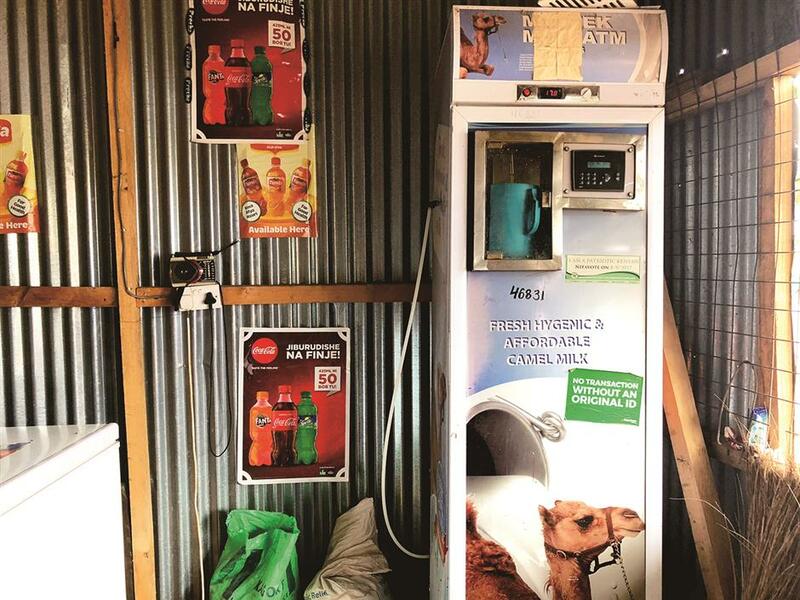 “For 100 Kenyan shillings (US$1), you get 1 liter of the freshest milk in Wajir county,” she said, opening a vending machine advertising “fresh, hygienic and affordable camel milk” in order to check the liquid’s temperature. One of the world’s biggest camel producers, East Africa also produces much of the world’s camel milk, almost all of it consumed domestically. In the northeast Kenyan county of Wajir, demand is booming among local people, who say it is healthier and more nutritious than cow’s milk. “Camel milk is everything,” said Noor Abdullahi, a project officer for US-based aid agency Mercy Corps. But temperatures averaging 40 degrees Celsius in the dry season, combined with the risk of dirty collection containers, mean the liquid can go sour in a matter of hours, he added, making it much harder to sell. To remedy this, an initiative is equipping about 50 women in Hadado, a village 80 kilometers from Wajir, with refrigerators to cool the milk that remote camel herders send them via tuk-tuk taxi, plus a van to transport it daily to Wajir. There, a dozen women milk traders including Sheikh Ali sell it through four ATM-like vending machines after receiving training on business skills such as accounting. “The (milk) supply and demand are there. We just have to make it easier for the milk to get from one point to another,” said Abdullahi. The project, which is part of the Building Resilience and Adaptation to Climate Extremes and Disasters program, is funded by the UK Department for International Development and led by Mercy Corps. 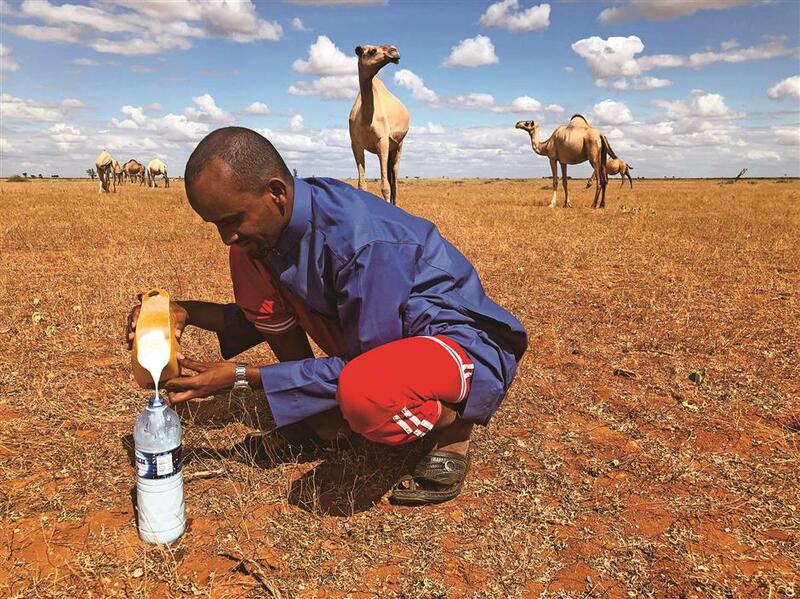 A client fills a water bottle with fresh camel milk in Hadado, Kenya, where the demand is booming among local people. Asha Abdi, a milk trader in Hadado who operates one of the refrigerators with 11 other women, said she used to have to boil camel’s milk‚ using costly and smoky firewood to prevent it turning sour. “I spent 100 shillings a day on firewood, and the milk would often go bad by the time it got to Wajir as the (public) transport took over three hours,” she said. Now Abdi and the other women in her group send about 500 liters of fresh milk to Wajir every day‚ a trip that takes just over an hour by van. They then reinvest the profits in other ventures. Amid hundreds of camels roaming stretches of orange dirt outside Hadado, Gedi Mohammed sits under the shade of a small acacia tree. “The (tuk-tuk) drivers should be here soon to buy my camel milk,” he said, sipping the precious liquid from a large wooden bowl. 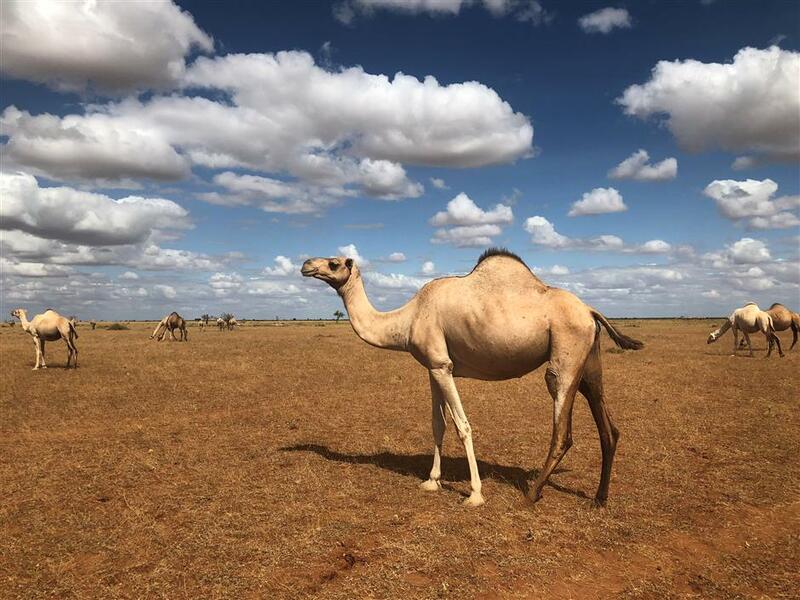 In Kenya’s largely pastoralist Wajir county, prolonged drought is pushing growing numbers of the region’s nomadic herders to see camels and their milk as a drought-safe investment. “Drought is bad for business because with less food and water the camels produce less milk,” he said, impatiently waving at a teenage boy to fetch a straying camel. “Business would be better if I had a vehicle to transport the milk to buyers myself,” said Mohammed, who said he has to travel ever-longer distances to find pastures for his animals. Back in Wajir, Sheikh Ali said her group’s cooled milk ATM allows her to save about 5,000 shillings per month, as she no longer has to buy firewood to boil milk and can sell the fresh liquid at a higher price. “Sometimes the machines break down, or indicate that there is no milk left when there are still 100 liters” inside, she explained. “So we have to wait for the machine supplier’s technician to travel all the way from Nairobi. It would be better to train someone locally,” she said.